It's unlikely you'll hurt a horse's hoof when using a simple hoof pick to clean it. However, if you don't learn how to properly ask for and hold the hoof, you could harm the leg or the horse could harm you. The old saying, "No hoof, no horse" holds true, so hoof cleaning should be part of your daily routine. A well-trained horse should easily lift his hoof for cleaning when you move your hand down his leg and gently grasp the ankle, or fetlock. Green horses, those with pain issues or uncooperative animals might not respond. Apply some slight pressure with your fingers on each side of the ankle to encourage him. If that doesn't work, lean into the horse somewhat so that his weight must shift to the leg on the other side. Once you have the hoof in your hand, take the hoof pick and remove dirt and debris. For best results, use a hoof pick with a brush attached to it for basic dirt removal, using the pick end to dislodge the deeper, packed mud. You can then clean out the clefts of the frog. If your horse flinches during any part of this process, there could be some sensitivity in the hoof due to bruising or infection. If your horse wears shoes, you must monitor their condition and how well they are staying on the hoof. If the shoe appears loose or has lost nails, call your farrier to have the shoe reset. A very loose shoe can hurt your horse and harm you if you come into contact with out-of-place nails. If the shoe feels even slightly loose, don't risk riding. Movement can dislodge the shoe and possibly tear off part of your horse's hoof with it. As you pick out those four hooves each day, pay careful attention to what you're doing. 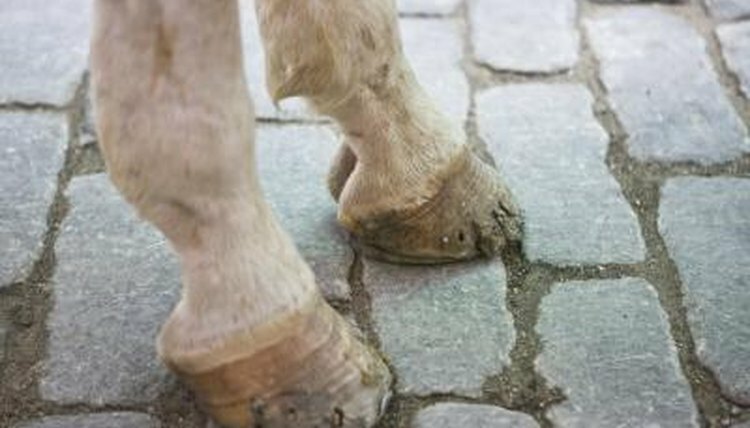 Feel your horse's feet for any signs of heat, which could indicate inflammation, an abscess brewing or the first signs of a serious condition called laminitis. A foul smell or black material in the frog is the sign of a common bacterial condition called thrush, which you can nip in the bud with over-the-counter remedies and by keeping your horse in a clean environment. If you find a puncture wound in your horse's foot, call your vet immediately. Not only should the vet remove any object still in the foot, but she can take X-rays and administer a tetanus shot or booster. Applying hoof dressing to keep your horse's feet supple won't harm you or the animal, although these dressings can be very messy. Medications for combating thrush, white line disease or other problems are a different story, as are products designed to strengthen the hoof. Whether obtained from your veterinarian or purchased over-the-counter, many of these substances contain potentially toxic materials. It's important to apply them only as directed and wear gloves during application.